I should start this post off by saying that it doesn't completely feel like fall here in Georgia. I drove around today and could fine ONE spot where some of the trees are orange and yellow. This one spot happens to be a few small trees in our neighbors yard, but that's it for miles. To cope with this, I made a breakfast that will trick anyone into thinking its perfectly fall all around no matter what it's actually like outside. What smells like delicious pumpkin pie, is healthy, easy to make, AND can cook while you sleep? 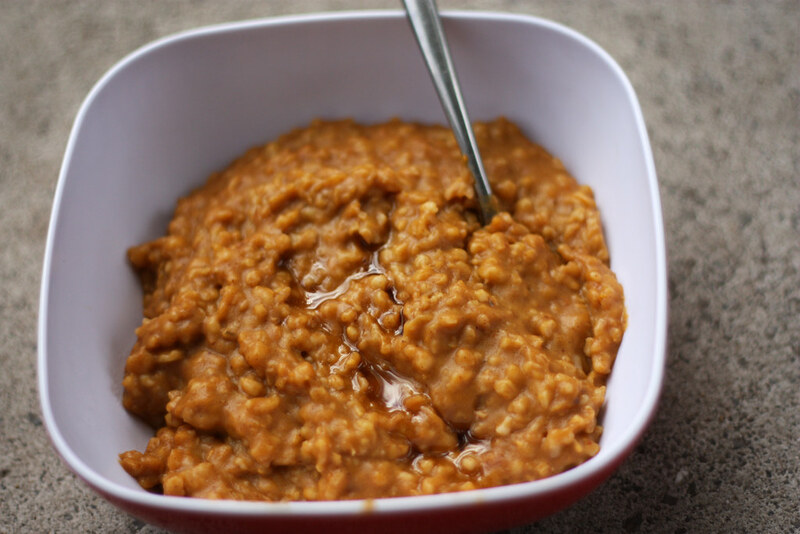 Pumpkin Spice Oatmeal made in the crock pot of course! 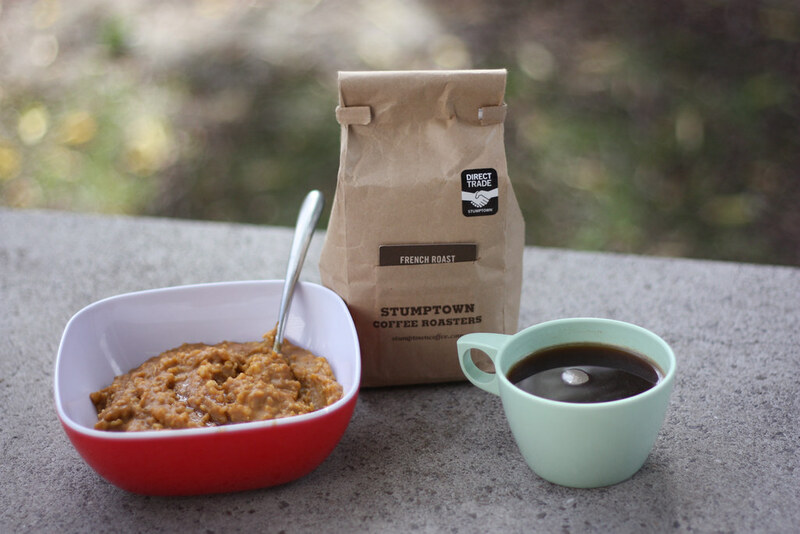 I supplemented this delicious breakfast with coffee I brought back from Portland, which happens to be the best coffee ever. So if oatmeal is your thing, go make this and then go to bed now. Put it all in your crock pot, cover, and set to low and then go to bed! I let mine cook for 8 hours, but 6 hours would also be good. Wake up to a delicious smelling kitchen and enjoy! I stirred in a little bit of ground flax seed and added a tiny bit more sweetener. I reheated some leftovers of this for breakfast this morning and it was a little too thick for my taste, so I added some more almond milk. When Derrick and I were in Portland last weekend we drove around looking for Stumptown coffee. Ha ha, We gave up trying to find it. Now I REALLY wish we didn't give up! @neiry mae Ha ha! No, I was just sitting here thinking "hey, I forgot the oats!" This looks amazing. Thanks for sharing! ^That was in a zombie voice. I can't wait to eat this! I have two pumpkins sitting around, I'm actually waiting till halloween night before I carve them so they won't rot and I've been trying to figure out a way I could use up the pumpkin really quickly and this looks like its going to work , thanks for the recipe! This looks so good! I'll have to try it, now that I have a kitchen and all. When you move back, lets figure out a way to only cook using crock pots, so we can sleep and wake up to yummy food every morning. I'm still recovering from a pumpkin cinnamon roll sugar coma! I'll have to use this recipe to ease my sugar come-down. Thanks for sharing! Hey, just found your blog! love, love, love it! Just gorgeous. oh my goodness i'm trying this for sure! honestly though, anything pumpkin related is the greatest! And in response to your comment on my last post (about a friggen year ago) I WANNA BE REAL LIFE FRIENDS SO BAD TOO! This looks ridiculously mouthwatering amazing. I eat oatmeal every morning....I need to make this! and get a crock pot!